I absolutely love it. Calm and quiet. 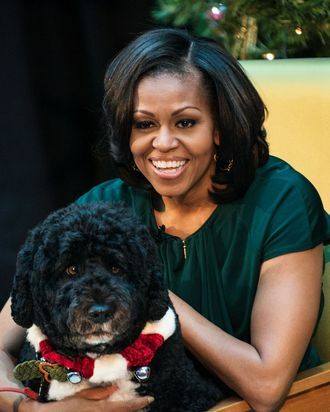 Michelle Obama and Bo looking for tough toys in PetSmart, which — I know from experience — do not exist. Unfortunately, even the so-called toughest plush toys available at PetSmart can be destroyed almost instantly by a dog who maintains a singular focus, which they so often do. No matter. Michelle Obama and Bo had a meaningful, quiet outing, and I look forward to the Before Sunrise–esque film that will result. If paid handsomely, I will write it myself. Thank you, Michelle and Bo. I love you.